Excuse the click-bait title, but I didn’t know what else to call this post. 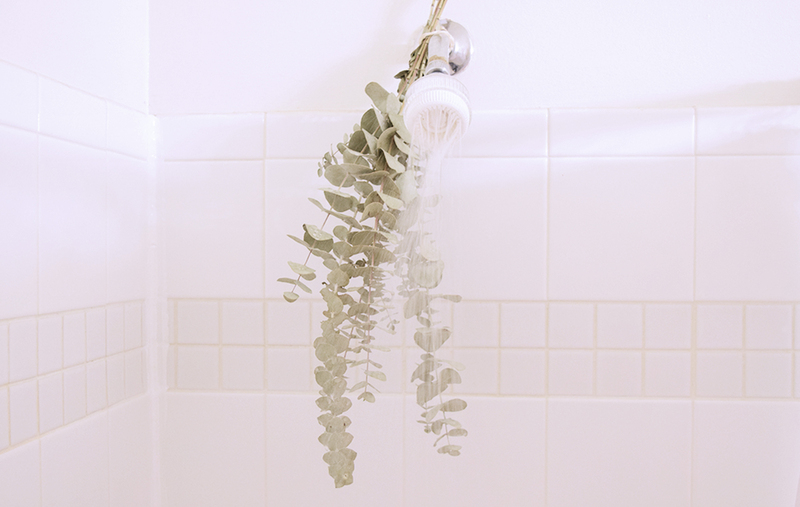 Eucalyptus in the Shower: you may have seen this around Instagram lately. All the cool girls in wellness are tying a bunch of eucalyptus on their shower heads for aromatherapy. It looks so darn cool, I had to try it. And guess what? It works. The steam from the shower creates a diffuser-like situation and the smell is energizing yet calming at the same time. Grab a bunch at Trader Joe's, Whole Foods or your farmer's market and experience the magic. Dry Brushing: continuing with the shower theme, some dry brushing before you jump in is actually insanely invigorating. I don’t do it as often as I’d like (read: lazy), but when I do I notice a difference. Can’t say I’ve had any breakthroughs with the reducing cellulite claims, but it does make my skin super soft (dry brush + shaving your legs + almond oil as your body oil = a winning combo). Dry brushes are super affordable, you can find them at Whole Foods or even Target (I like one like this with a removable handle) and you just brush towards your heart in long strokes or small circles. Easy, I promise. Activated Charcoal: okay, please don’t use charcoal because you think it will detox you and make you loose weight (whole ‘notha topic for a whole ‘notha time). I use this when I’ve had something I know doesn’t agree with my gut (dairy, processed sugar, anything really heavy or fried), and I need to get it out, ya know? I pop a couple of tablets (this is my favorite brand) at night with some water and by the morning all the not-so-great-stuff is flushed out of my system. Again, this isn’t a stupid weight-loss plan and I certainly don’t take charcoal regularly (that would deplete nutrients). Use with common sense and don’t go nuts, yeah? Foam Rolling: this is so trendy right now, but I take a little pride in saying I’ve been foam rolling for the past 5+ years. It all started when my doctor of osteopathic medicine was treating me for tilted patella's (aka gnarly knee pain that made me feel like I was surgery-bound). Turns out, part of my issue was tight IT bands that were pulling my kneecaps out of place. Enter foam rolling. Enter torture. The first few times I rolled the IT’s out, I thought I was going to die. But I kept at it and slowly things loosened up and my knee pain was pretty much knocked out. I started foam rolling everything (the cheap girl’s massage) and it’s heavenly. I used to work trade shows at an old job and would travel with the roller to get out all the kinks from standing all day. My co-workers thought I was nuts until one of them had a calf cramp and needed my trusty roller. Moral of the story: get a cheap, pretty firm one from Amazon - you really don’t need those fancy $40 ones - and roll out everything. Your body will thank you. Magnesium: oh magnesium, how I love you. Raise your hand if you have a hard time winding down and going to sleep? It’s like my brain kicks in at 10pm and all of a sudden I’m determined to finish the book I’m reading, scouring the internet for whatever bizarre topic that's popped into my head or Googling what all the members of the Backstreet Boys are doing now. Not conducive for sleep. So what’s a wandering brain to do? Get on the Natural Calm Magnesium. Start with a teaspoon in a mug, pour some hot/boiling water and let it fizz up. When it stops fizzing, top it off with a little more water (not too much or you’ll be up in the middle of the night), give it a stir, get comfy in bed and sip on it. Try your best not to look at your phone. Bonus points if you’ve got some lavender oil diffusing. No joke, within a few minutes of finishing it, I feel drugged in the best way and fall asleep so fast. Racing thoughts got nothing on magnesium. What kind of weird wellness hacks do you have? Are you a fan of any I mentioned here? What am I missing - I looooove new recommendations so spill your secrets!